Continuing education is important to us! Rockweiler hosts HPIP regional training. 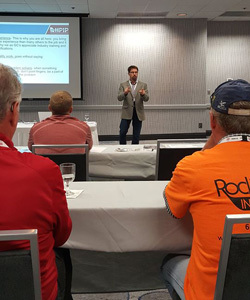 Rockweiler Insulation recently had the opportunity to host a free regional training in conjunction with HPIP (High Performance Insulation Professionals) for insulators and other construction professionals. 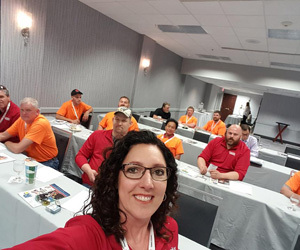 Attendees learned the best techniques to achieve grade-one installation standards as well as job safety, building codes, building science, and more. It was a great opportunity for our entire organization to spend two days together brushing up on our insulation knowledge. This two-day training was a combination of classroom sessions and hands-on training. All the major insulation manufacturers provided valuable instruction on a variety of topics including How Insulation Works, Understanding Air Leakage & Sealing, The Evolution of Building Codes and Building Science, and more. Local guest speakers included Jeff Grundahl of Brio Design Homes and Vive Home Transformations, and John Crook, building inspector from City of Fitchburg. 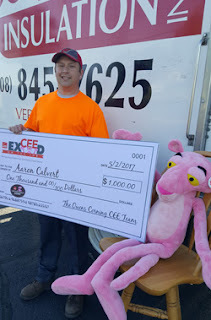 They provided excellent perspectives on the relationship between insulation contractors and their builders and building inspectors. After a day in the classroom the learning continued on day two at a jobsite. The day began with the most important topic – jobsite safety, and included a walk-through to point out any potential hazards installers may encounter. That was followed by a demonstration of blowing machine operation and maintenance from CertainTeed Machine Works. Then the attendees divided into groups and went through stations for hands-on demonstrations of Owens Corning ProPink Complete, Knauf Insulation EcoSeal+, CertainTeed MemBrain & Fiberglass batts, and Johns Manville Spider Plus applications. Following the training each attendee took an exam and those who passed received a high-performance certification. Thank you to HPIP and all the manufacturer and community partners for contributing to this training in support of building excellence and energy efficiency!